Architects Jeffrey Day and E.B. Min updated Tyler and Danielle Lenczuk’s town house by embracing high- and low-tech fixes, from modular furniture to connected thermostats. 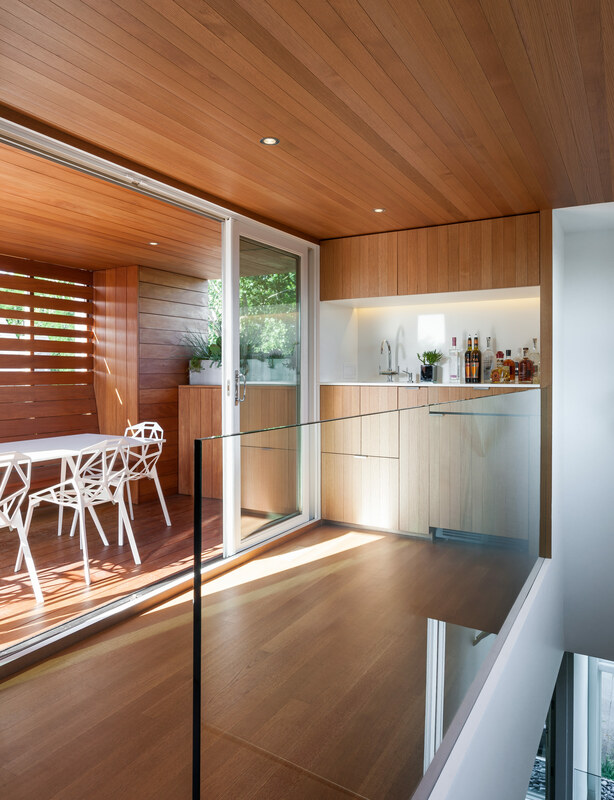 A penthouse kitchenette services a covered deck. Lutron smart controls manage the new kitchen’s abundance of lighting options, including an Axis twin-beam pendant that hangs directly over the island. “The goal was to make the house work the way the owners wanted it to, but to be strategic about how we did that so the money they put in was of real benefit,” explains Day, whose practice the Lenczuks discovered online. Bartco fluorescent strips are hidden in the coves overhead. Smart & Green Ball lamps illuminate the penthouse deck, which is outfitted with low-slung Matrass lounge furniture from Quinze & Milan. All of the exterior spaces are lined in rich garapa hardwood. A sculptural picnic table by artist Michael Beitz flows over the fence like a waterfall. Thanks in part to landscape architect James C. Differding, the residents can enjoy the outdoors on all four levels, from the pocket garden that buffers the house from the street to the rooftop enclave. In the office, doors slide back and a chair pulls out to reveal a custom built-in desk. When closed, the miniature workspace vanishes into the detailed white oak millwork by KWI Cabinetry. Parts of a modular 345 coffee table, designed by Min | Day’s furniture company, MOD, are dispersed throughout the house, including two pieces in the family room. The architects designed around another component of their 345 table in the refurnished living room, adding a Ploum sofa and a pair of Elsa armchairs from Ligne Roset. Fractal alcoves punctuate the cabinetry. If Tyler and Danielle Lenczuk’s remodeled town house has a heart, it’s the multilevel back deck, where the young couple love to grill with friends and family in classic Chicago style. If it has a brain, however, it’s the stack of black boxes lurking behind a closet door in the basement. That’s the control tower for a home automation system that empowers the Lenczuks to adjust everything from heating and lighting to window blinds, music, TVs, and security with a few taps on their iPads. Adding it was one of the many ways architects Jeffrey Day and E. B. Min transformed a nondescript spec house into an urban enclave tailored to their clients’ personalities—although doing so required a few trade-offs. The couple liked Day and Min’s brand of comfortable modernism, and they asked the pair—who are based in Omaha and San Francisco, respectively—to select new furniture and fix up the decks, which were already showing signs of deterioration. The project quickly expanded into an ambitious reworking of the entire home. Although the architects didn’t move any walls or windows, they warmed up the interiors with solid white oak paneling, bracing red highlights, and quirky surprises like motorized liquor cabinet by KWI Cab-inetry that drops out of a wall. They also brought in an art consultant, who commissioned a drawing and sculpture for the home, and Parsons professor Derek Porter, who designed some of the custom lighting, including an installation of fluorescent lights that darts up the stairwell in the entryway. Bringing smart tech into the mix was a given for Danielle and Tyler, whose interest in the field is more than gener-ational: Tyler’s family business manufactures garage door openers, one of the earliest wireless home devices developed. But fully automating an existing home presented some challenges. While basic lighting and audio systems were already in place, and the existing thermostats could easily be exchanged for self-programming ones from Nest, expanding the network of smart controls required tearing out walls and ceilings. “We had to prioritize what we wanted and what was crazy to do,” Danielle says. In the case of lights, that meant upgrading the Lutron system in the most heavily trafficked parts of the home, where the wiring was being rearranged anyway, but leaving conventional switches in less frequently used hallways and bathrooms. For the ADT security system, on the other hand, the Lenczuks use a mostly wired system, even though it was more difficult to install, because they wanted to be able to depend on it even if their Internet connection went down. These fixes ultimately fit into a much broader plan to mold the house to its inhabitants. “It’s not that you walk in and think, ‘Oh, I’m in a smart home,’” says Day. “It’s more that the smart technologies support ease of use and allow it to be a place where you can change moods quickly.” For Tyler and Danielle, that has made the difference between a show house and a home.